How to Have Difficult Conversations with Boss? We all sometimes have to face an ultimate conversation with some people, if such a stage comes, it may emanate in retaliation or breakdown in relations. 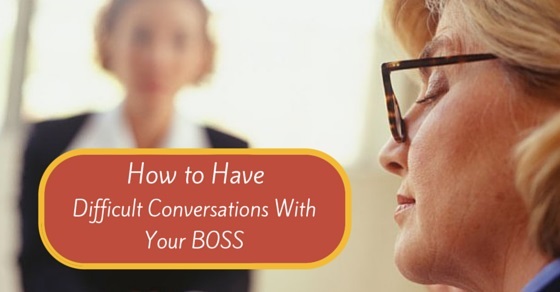 There can be situations when one has to have a laborious conversation with their boss. The reasons for hard conversations can be regarding of receiving a disappointing performance evaluation, asking for a pay increase, being micromanaged or it can also be working with a weak co-worker. These issues need to be handled with cool mind and with a lot of care. It is very important not to lose the ropes of the mind if any situation like this arises. Communication always needs to be handled with care because a little bit of unpreparedness can lead to a disaster. The following mentioned are few top ways on how to make conversation which is difficult with your employers and tips on how to hold a conversation. Suppose one wants to have a talk regarding increase in the payment, then it is must that the employee should know for what reason and why should the increment be done, give the boss a soundness for it, because if he will put himself clearly then only the boss will agree. Such are the times when someone easily loses the cool of mind. These situations need to be handled with great responsibility. While handling difficult conversations on the boss does not agree to negotiate, then the employee must find another way to make the issue important. Rather than complaining, it is better to stop for the time and try it again when it is right. Losing the control of emotions can only make it bad. The most crucial part is to decide about when and where to start a talk. Avoid conversing when you feel like there is something negative in the atmosphere. The best time is when the boss is happy with the work done and he appreciates you for the same and there you spark a conversation with a light mood. Whenever such a talk is to be done, one must do best to make it persuasive, and if possible make it interactive where both could not be interrupted. Going in prepared does not only mean being sure about the issue but it also means that one should also presume the results, that is if it proves successful or in case it fails. Though one always takes a step when he or she is sure about getting a positive result but one should also go for hypothesis. Handling difficult conversations or talks with the boss cannot always turn out to be good, but the objective should be clear. Suppose you are being micromanaged and you want to be treated as an employee, first of all do look for other examples in which others are being micromanaged, after evaluating this make sure that you decide the right time for discussing this problem with the boss then later on make a clear picture of the situation and clarify him for what you are having conversations for. In this case if you don’t want to be treated as a fresher make your boss clear about it. Though it is always said that silence is golden and anybody’s silence should be appreciated. One should never get irritated when the other person is not participating equally in the conversation, being quiet does not only mean ignoring but it can also mean that the person is understanding the issue. There are always two kinds of people in the world, one are the extroverts who speak a lot and others are the introverts who speak less. When there is silence don’t speak at that time let the other person take that moment and help him sink in the message which can result into a good outcome. There is no such conversation which does not have a conflict in it. Having a talk with someone means there will be some collisions. When one already knows about having a conflict then it is a must that the person should know how to handle the heated argument. In such crucial times the words used should be reasonable and not offensive. Most of the time the people try to turn the situation into their own advantage, in other words they try best to stop you from accomplishing the purpose of conversation. There are many such mistakes which are committed while conducting a difficult conversation which leads in providing the other person the chance to not let you succeed. It is better to convey truly about you being defended because ignoring such situations will result into nothing and the purpose of the talk will remain unfinished. While discussing your disappointing performance evolution, your boss may tell you that if you meet certain goals then maybe it direct towards a good conversation next time. Make it possible to arrive at a mutual understanding. Another crucial situation is when only you speak and don’t allow the other person to keep his views. In situations like these, one should always ask for the boss’s perspective about the issue being discussed. If the difficult conversation at work is about, you don’t want to work with a weak co-worker and want someone who knows the work, then, in this case, may be the boss had set you to work with the weak co-worker in order to have the latter some experience regarding the work. Sometimes listening does help. The very common mistakes done during common conversation are that we sometimes try to oversimplify the problems, no respect is given to the conversations, we do react to the thwarting ploys which strictly should be avoided, we do get hooked because everyone does have a weak point, and at last we lose our goal which further results in no interest of the boss in the conversation. It is thus very important to avoid any kind of blooper from our side. As we all know that to build bridges between people it takes time and with a little bit of negligence, even the bridge can collapse. An employee may have a big conflict; he must not in any situation get aggressive towards the boss. As discussed earlier the difficult conversation can easily make you lose your mind but in a case of profession, this needs to be avoided. Conduct a conversation with planning. All the above points do state about how should be a heated conversation with the boss be handled. Moreover, always four basic steps should be followed during such a situation. The very first thing is to be prepared about the topic to be discussed, second step is to initiate a conversation that is one should know how to start the talk, thirdly the STATE of discussion which includes sharing the facts, telling the story behind it, asking for the view, talking tentatively and encouraging testing, lastly concluding the conversation with something so solid that it makes the boss to consider the situation seriously. A job never goes on smoothly, everyone faces obstructions, but in such times only your manager or the head can prove to be the best help. They not only find a solution but they aim at making you comfortable in every phase. At the end, it is best to be clear, direct and unemotional showing yourself strong and putting into the right mind of a frame. Previous articleCan you Record Conversations with your Boss? Next articleHow to Overcome Performance Appraisal Problems?